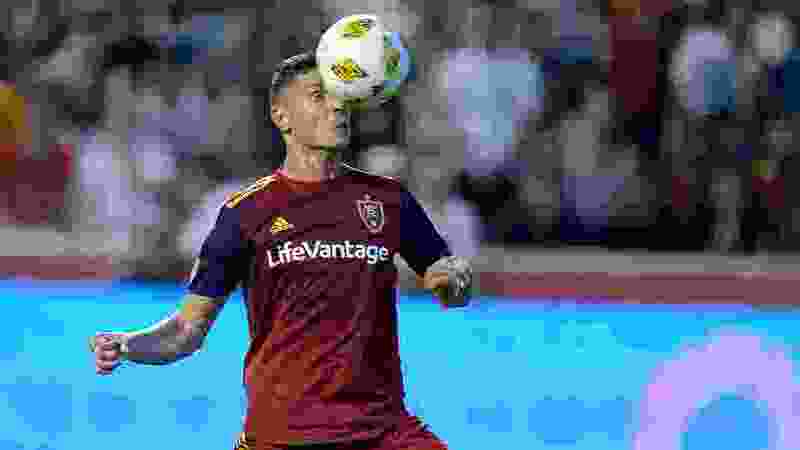 Sandy • Damir Kreilach stood just off the grass of Rio Tinto Stadium on Friday and conveyed the sentiment that Real Salt Lake was looking to turn over a new leaf after starting just 1-4-1 in its first six games and losing four straight. “Tomorrow starts [a] new season for us,” Kreilach said. On Saturday against Orlando City SC, RSL started its “new season” on the right foot. Kreilach and striker Sam Johnson each scored to lift Real to a 2-1 win over the City. Coach Mike Petke said the game looked different throughout – sometimes gritty, sometimes well-played, sometimes “nervy.” But until he sees what transpires in subsequent weeks, he won’t characterize the win as something that portends future success. Petke did like the way his team answered the challenge of Dom Dwyer and Nani — two of Orlando City’s best players — entering the second half. “I thought we contained them very well, I thought we got back, I thought we did enough to deny them at times,” Petke said. Johnson’s goal, which came in the 17th minute, marked the first goal of his Major League Soccer career. Earlier this week, he lamented that he hadn’t been able to score in five appearances with his new club, but said it felt like a matter of time until he got one. He did it in when, while well within the 18-yard box, he tripped and fell to the ground. The ball squirted free, but no Orlando City defender cleared or took possession of it. Johnson got up, found the ball and shot a rocket that found the back of the net for a 1-0 RSL lead. Johnson said it felt good to score his first MLS goal, and that it was important for a player at his position to get that first one out of the way. He added that strikers scoring goals are what fans what and expect out of them. Kreilach’s shot came in the second half and from a clinical sequence. Aaron Herrera, who started at right back, played a long ball to Jefferson Savarino. The Venezuelan nutmegged a pass through his defender and right to Kreilach, who scored from around the penalty spot to put Real up 2-0 in the 55th minute. Orlando City forward Nani scored in the 81st minute off a free kick to cut RSL’s lead to 2-1. Real held on for its second win of the 2019 season. Everton Luiz sufferd an injury to his left knee in the 23rd minute and left the game. Petke said he will receive an MRI.